The “Mayor’s Ride” started in fall 2013, and has grown each year to become the largest and most significant group bike ride in town. The “Mayor’s Bike Ride” is actually two rides: a 3-mile ride, and a longer 7-mile route. 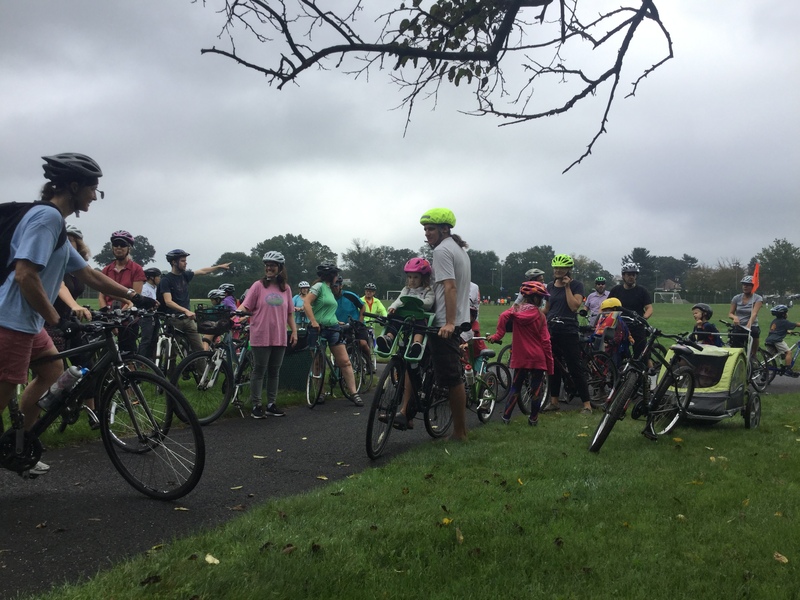 The ride is aimed at riders of all ages and abilities, and many families took part, with kids either in trailers, tagalong bikes, or riding by themselves! 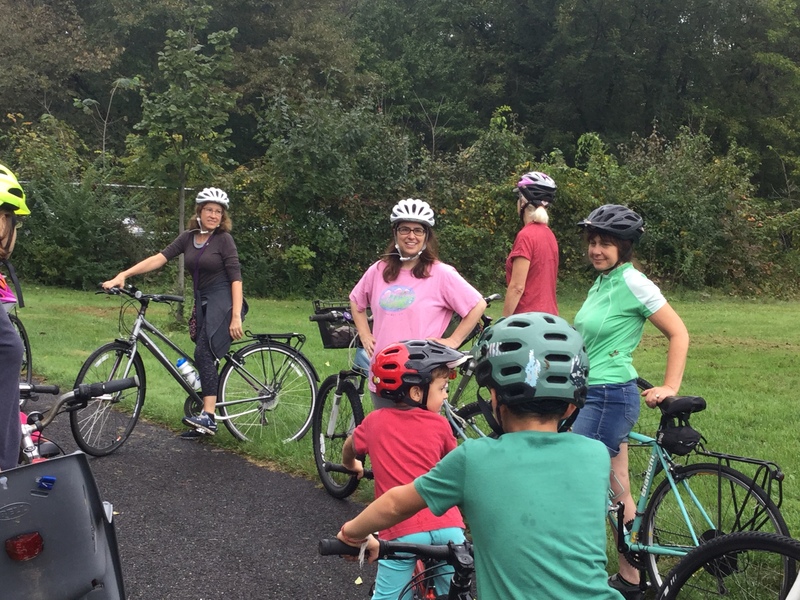 The ride demonstrates the qualities and deficiencies of Princeton’s on-street bike network. On Mountain Ave, many riders preferred to ride on the road instead of the extremely bumpy sidepath. 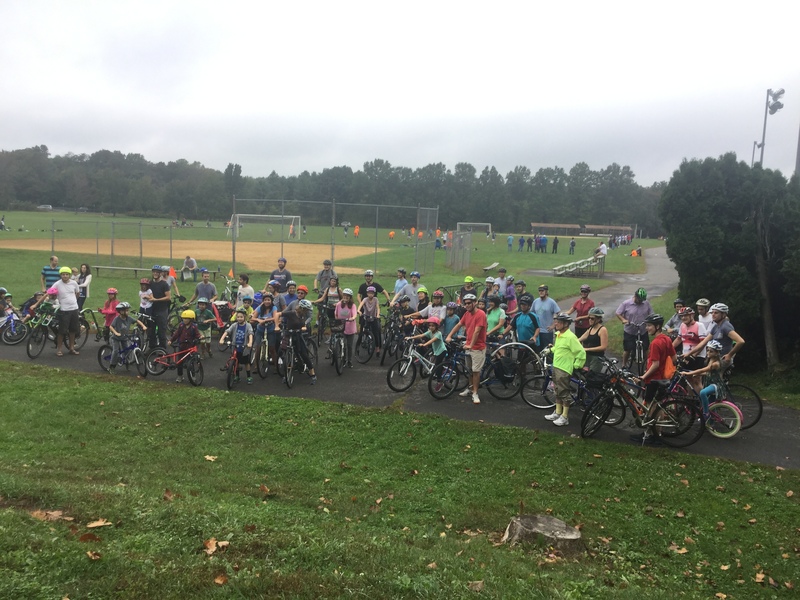 Riders on the 7-mile route were more easily able to cross Great Road thanks to a recently-installed traffic signal, however, which provides a connection to the ‘trolley trail’ path that leads to Johnson Park School. 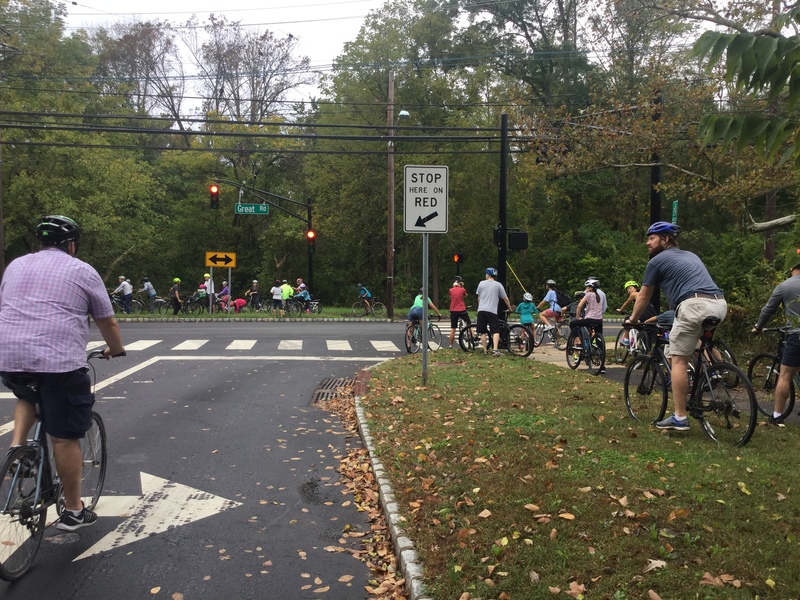 Riders crossing Great Road at newly-installed traffic signal on Mountain Ave.
After a hill climb that proved slightly challenging for some riders, the group entered Mountain Lakes Park, where Friends of Princeton Open Space have been actively improving trails in recent years. Princeton Mayor Liz Lempert leads riders into Mountail Lakes Park at the J. Seward Johnson boardwalk. 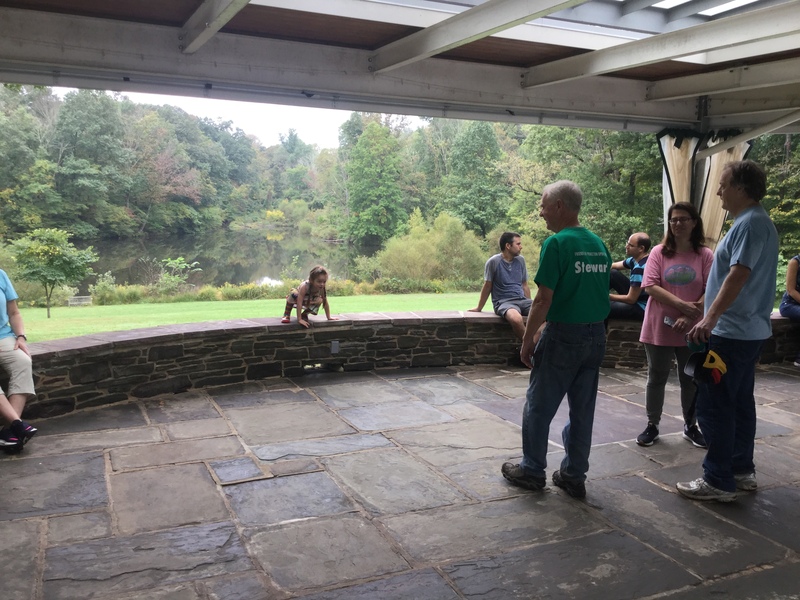 The ride ended at Mountain Lakes House, where apple cider and doughnuts were served. In addition to Mayor Liz Lempert, Princeton Council Members Tim Quinn, David Cohen, and Leticia Fraga took part. Lempert relaxes with riders at Mountain Lakes House after the ride. For more photos of the “Mayor’s Bike Ride”, see Councilman Tim Quinn’s Facebook Page at this link. 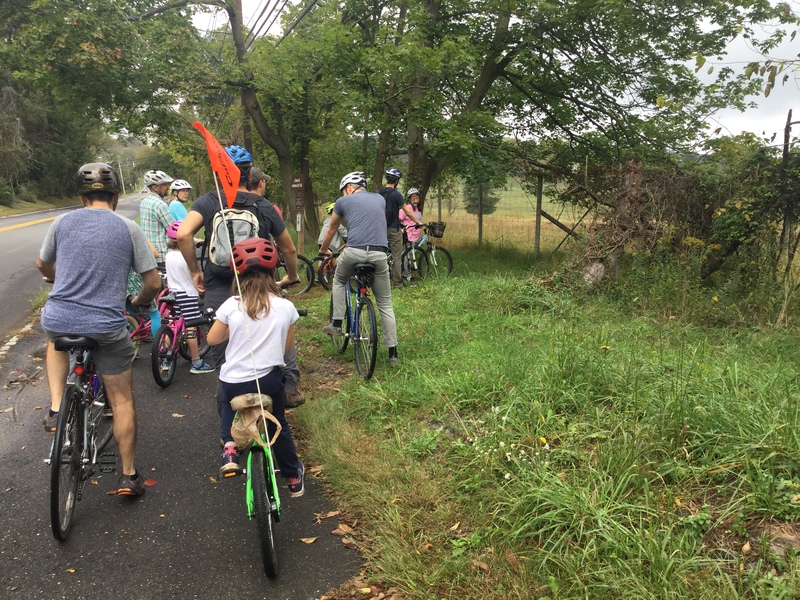 More family bike rides are being organized this fall by Jay’s Cycle Store on Nassau St. Their next ride is scheduled for Sunday October 14, starting from their store, and proceeding for about an hour down and along the D&R Canal Towpath. Fule details here. 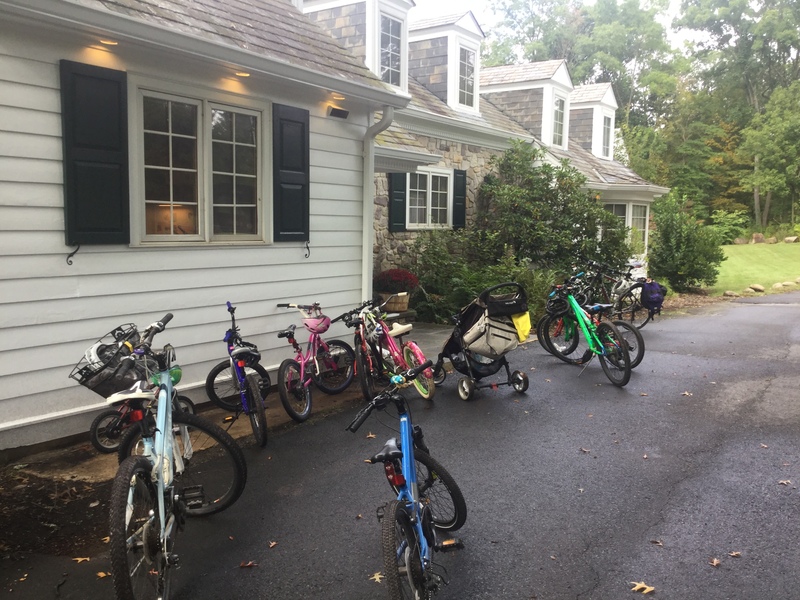 A selection of bicycles at Mountain Lakes House. This entry was posted in Alternative Transportation, Biking, Community, Complete Streets, People, Princeton, Trails and tagged bikes, Cycling, Princeton. Bookmark the permalink.